Where would I find the MOSFET type? on the top side of it? Must have missed that, I'll go look again. 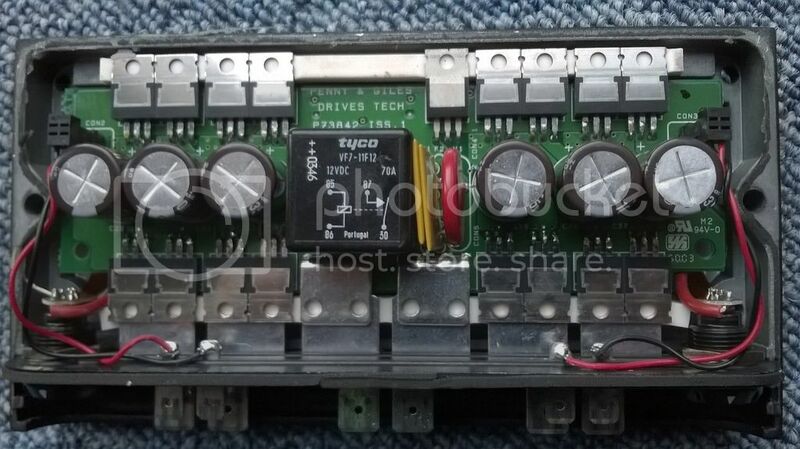 However the device you linked to is still manufactured (just no longer stocked by my usual supplier) but its a recent (11/2014) product, unlikely to be found in a >5y old controller..
steves1977uk wrote: Where would I find the MOSFET type? on the top side of it? Yes on the side opposite the tab. Incidentally these devices are limited to 75A by the TO220AB package. The silicon is good to 175A. So with only 2 parallel devices 150A is the maximum you can upgrade it to. OK I give up, I've looked again and can't see it..
No. Those just go to the relay. And that would do what the roboteq does and sense battery current? Burgerman wrote: No. Those just go to the relay. And that would do what the roboteq does and sense battery current? yes, I can see that now. Might not be sense resistors but just some carefully sized PCB tracks..
Are those the actual devices? It's just a general specshet on the IRF1010N. If these were replaced, what would be a better replacement?